Well, I knew that the headline would get somebody’s attention…. Yes, Ben Verlander, brother of Detroit Tigers’ ace Justin Verlander, will suit up for the Whitecaps this season. He was a 14th round pick out of Old Dominion last season, who batted .219 for the Connecticut Tigers in 2013, and was a NY-Penn League All-Star. Another 2013 draft pick joining the team this season is starting pitcher Jonathan Crawford, who is ranked as the Tiger’s #5 prospect by MLB.com. Crawford pitched three seasons of NCAA baseball for the Florida Gators, and threw two games for the C-Tigs. Kevin Ziomek will also be a quality arm on the Whitecaps pitching staff. The lefty is a second-round pick (third overall) by Detroit last season out of Vanderbilt, pitched eight innings in four games for Connecticut. Right-hander Zac Reininger will be a force to recon with on the mound also, once he’s off the seven-day DL, as he posted a 1.00 ERA in 22 games also with Connecticut last season. The Whitecaps should also get some starts from pitchers Austin Kubitza, Buck Farmer, and Chad Green. Another top-20 prospect in West Michigan this season will be shortstop Javier Betancourt. The 18-year-old played for the Gulf Coast League Tigers last season, hitting .333, and only stuck out 14 times in 177 at bats. He was also named the GLC Tigers’ Player of the Year. Austin Schotts will be returning for a second stint with the Whitecaps this season. The Whitecaps roster will include some familiar faces also, in players such as pitchers Jeff Thompson, Montreal Robertson, Julio Felix, and Jonathon Miciel, catcher Bennett Pickar, infielders Dominic Ficociello and Curt Powell, and outfielders Raph Rhymes and Austin Schotts. Rhymes came to the ‘Caps last season after being a 15th round pick by the Tigers out of LSU, and was the NCAA batting champion in 2012. He hit .345 last season, good for second best on the team. Schotts was the starting center fielder in West Michigan last season, before finishing up the year down in Connecticut. The Whitecaps will be led this season by new manager Andrew Graham, who coached a decent chunk of the roster in Connecticut last season. He’ll try to bring a playoff berth to West Michigan for the first time in three seasons. This looks like it could be a really exciting season in West Michigan, with the roster sporting seven pitchers from the first ten rounds of last season’s draft, and plenty of college experience for the position players. I really look forward to seeing this team on the field, and can’t wait until April 12th! 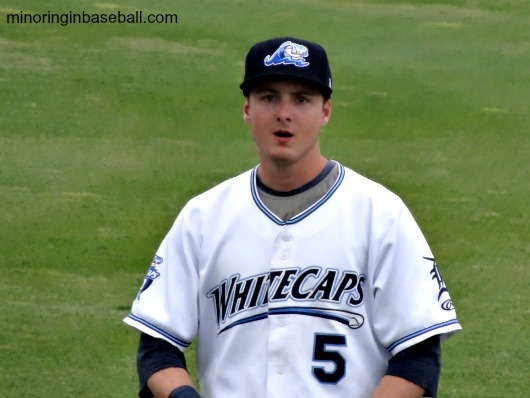 You can view the complete 2014 Whitecaps roster HERE!